Available for order from third quarter 2016 the new Yanmar YT Series tractors are set to make an impact in the compact tractor market. With the number of professional farmers and agricultural collectives in Japan steadily increasing, there is a greater demand for agricultural machinery that is highly-efficient, highly-functional, and low-cost. Considering this trend, Yanmar is addressing farmers’ needs of “comfort, control, potential, and pride” with the new flagship model YT Series large-size tractor. Under the slogan “Creating a new agriculture”, world-renowned Ken Okuyama (also a director of Yanmar Holdings Co., Ltd.) heads product design. The YT Series tractor utilizes the same innovative and unique “premium design” as the combine we are releasing at the same time. With a new “premium red” color, more striking than Yanmar’s usual red, and a body design that evokes a sense of strength, farmers can further enjoy their everyday work and take pride in the refined construction of their tractor. Operators have access to a 330° view from inside the cabin thanks to rounded glass on all sides. No detail was forgotten: even before customers enter the tractor an adjustable aluminum step projects a feeling of luxury. Also focusing on ease-of-use, levers and switches used often during operation are placed above the armrest and create a new working experience. Operators can check various machine settings and conditions in an instant on the color monitor located to their right. Our acclaimed continuously variable transmission has been further improved for increased functionality and efficiency. The powerful and eco-friendly Yanmar green diesel engine has cleared Japan’s Tier 3 gas emissions regulations. 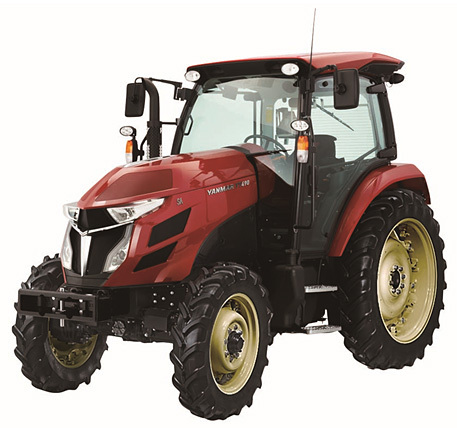 Advanced design and simple yet sturdy functioning come together in Yanmar’s flagship model YT Series, making this premium tractor a vital addition to every professional farmer’s lineup of machinery.